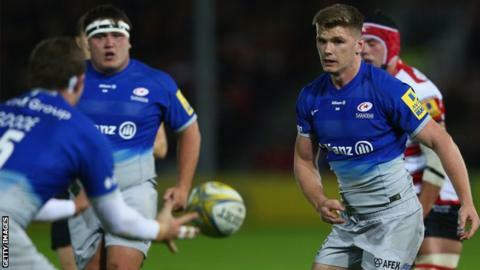 Owen Farrell's late penalty secured victory for Saracens over Gloucester in a tight contest at Kingsholm. Sarries led 11-6 at the break thanks to penalties from Charlie Hodgson and Farrell, and Mike Ellery's try. Billy Twelvetrees sent over five penalties in total, and looked to have won it when he kicked Gloucester 15-14 ahead with five minutes remaining. However, Farrell kept up the defending champions' 100% start and consigned Gloucester to their first defeat. Ellery's try lit up a first half at Kingsholm littered with kicks for territory, with the overlap created as a result of Farrell's midfield break in a rare moment of quality. Hodgson missed the conversion but sent over a later penalty and, although Saracens' lead was temporarily cut to two points through the boot of Twelvetrees, Farrell's late kick sent them into the break five points up. Twelvetrees reduced that lead having moments earlier been unable to find Jonny May with a free run to the line - and his failure to send the England wing over would prove to be a key moment in the match. The Gloucester skipper edged the hosts ahead with his fourth penalty of the night before Farrell made amends for an earlier miss to put Sarries in front as 12 minutes remained. Twelvetrees looked to have won it with a sensational kick from halfway but Gloucester could not keep their discipline and conceded a penalty direct from the restart, from which Farrell secured victory. "It's disappointing. Physically I thought the players were right up there. Ultimately against a team as good as Saracens it is going to turn on fine margins. "The first half was very good with ball in hand and defensively the set-piece was good. In the second half Saracens hung in there and took their points when they were on offer - and we are disappointed to get ourselves in the lead with four minutes to go and then Jonny May unfortunately slips and we concede a penalty. "It's the first time we've lost here in 2015, and regardless of tonight's result this has become a difficult place to play. "Ben Morgan has received some criticism this week but I think he answered it in style. He worked really hard, carried the ball, played 80 minutes and had an outstanding game." "It was a bit of a war of attrition out there - I think Gloucester are going to be very difficult to beat. "At times we struggled. In the second half we found a bit more field position and when it's a two-point game it can go either way, so it's a brilliant win. "We had a titanic struggle against them last year which came down to the last kick and when Billy Twelvetrees kicked his penalty from 50 metres there was an element of deja vu. "But from the kick off you saw the character of the team shine through." Gloucester: Sharples; Halaifonua, Twelvetrees (capt), Meakes, May; Hook, Heinz; McAllister, Hibbard, Afoa, Savage, Kalamafoni, Ludlow, Kvesic, Morgan. Replacements: Lindsay, Thomas, Doran-Jones, Stooke, Rowan, Braley, McColl, Cook. Saracens: Goode; Ashton, Tompkins, Farrell, Ellery; Hodgson, de Kock; M Vunipola, George (capt), du Plessis, Kruis, Hamilton, Rhodes, Brown, Wray. Replacements: Saunders, Gill, Lamositele, Hargreaves, Fraser, Wigglesworth, Mordt, Ransom.